We interrupt our regular blogging schedule to announce that Title Junction is partnering with the Salvation Army to host an Angel Tree this Christmas Season! The Angel Tree Program was created by the Salvation Army in 1979 to provide toys and clothing to children in need. In Lee County alone, there are over 28,000 children who live in poverty. Many of their parents don’t have the financial means to buy them any gifts for Christmas, so that’s where we step in! Participating organizations and businesses (like Title Junction) hang Angel Tags from a Christmas tree, with each child represented by a numerical code along with information about their age, gender, clothing size, and what they want for Christmas. People can choose the Angel they want to adopt from the tree and then purchase gifts for their Angel. This year, Title Junction has been entrusted with 50 Angels who need to be adopted by caring souls…like you! 1. Pick your Angel from the Angel Tree. 2. Buy new toy(s) and/or clothing for your Angel. 3. 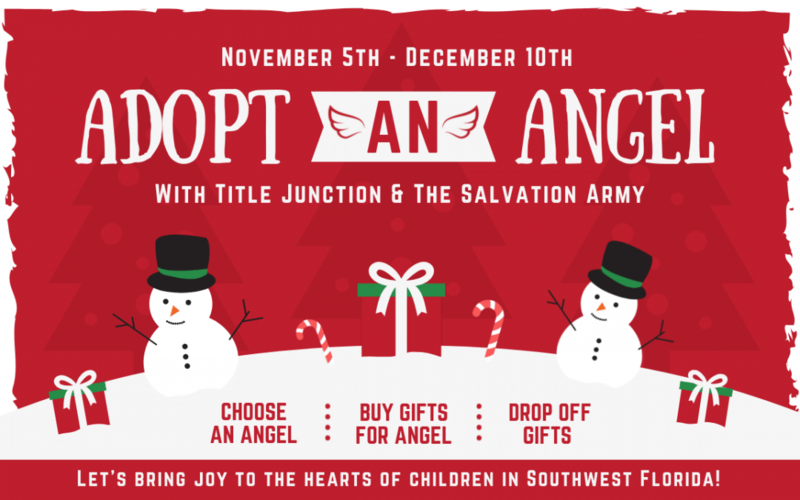 Drop off the new, unwrapped gift(s) in a bag with the Angel Tag attached at Title Junction by December 10th. If you have more than one bag, make sure to label them with your Angel’s code as well. Once Title Junction receives all of the new, unwrapped gifts for the Angels, the Salvation Army will take the gifts and distribute them to the families. You won’t know the identity of your Angel, but you will have the satisfaction of knowing that you’ve brought joy and hope to a child this Christmas season. For more information give us a call at 239.415.6574 or email us at [email protected].